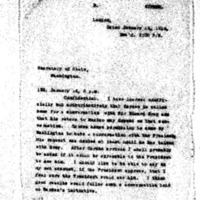 Walter Hines Page writes to William Jennings Bryan about the Carden incident. I have learned unofficially but authoritatively that Carden is called home for a conversation with Sir Edward Grey and that his return to Mexico may depend on that conversation. Carden asked permission to come by Washington to have a conversation with the President. His request was denied at least until he has talked with Grey. After Carden arrives I shall probably be asked if it would be agreeable to the President to see him. I should like to be able to say on my own account, if the President approve, that I feel sure the President would see him. I think good results would follow such a conversation held on Carden’s initiative. There are persistent rumors in journalistic and financial quarters that a sort of concerted newspaper attack will soon be made on the President, probably simultaneously on both sides of the Atlantic, for waiting too long in the hope of Huerta’s withdrawal or downfall; and these newspapers will ask what plan the President has in case Huerta continues in office indefinitely. The British Goverenment, I hear, will also be criticised on too patient passive attitude. I am informed secretly by Tyrrell that Sir Edward Grey will ask me in a few days as soon as he returns to town, what the President will do if Huertaa holds out indefinitely. Can you send me instructions what to answer? P A G E .
Page, Walter Hines, 1855-1918, “Walter Hines Page to William Jennings Bryan,” 1914 January 14, WWP18283, First Year Wilson Papers, Woodrow Wilson Presidential Library & Museum, Staunton, Virginia.